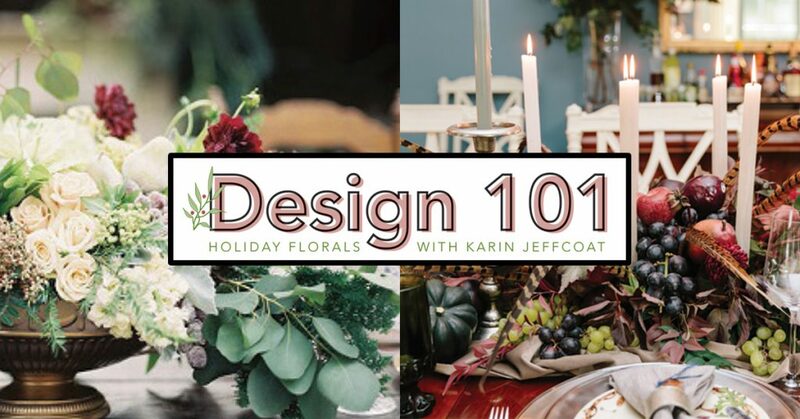 We just kicked off our Design 101 series with a full house event at our Sandy Springs location, featuring the amazing event designer Karin Jeffcoat of Cote Designs! Karin has spent 20 years refining her craft creating luxury events and serving as Augusta National’s floral director, but you will always find her with a little dirt under her nails, a warm smile, and breathtaking florals spilling out of her suburban. Southern Accents, The Knot, and Magnolia Rouge. companies such as Rolex, ATT, UPS, Exxon, and CBS. Karin brings a uniquely southern flair to all of her designs— focusing on the idea of utilizing the bounty of greenery that grows in our own backyards (or along most state roads in Georgia and South Carolina) as the foundation for her holiday creations. To begin the seminar, Karin started with a primer of greenery and florals that can be found growing in our sweet southern climate or, if necessary, purchased at specialty grocers like Whole Foods, Fresh Market or Trader Joe’s. This stunning green and white arrangement features white Camellias and Camellia foliage, Sapphire Cedar and berries cut from our yards and mixed with Ligustrum berries, Star of Bethlehem and white roses. Much of the greenery used to create the incredible designs that you will see throughout this post were cut from the roadside on our own personal property the morning of the event. Some of her favorites include Gem Magnolia, Sapphire Cedar, Ligustrum Berries, Nandina and Nandina Berries, Camellias and Camellia foliage, Star of Bethlehem, and Holly. Karin works her magic placing Magnolia in an open freeform arrangement. Most of the florals were purchased at Trader Joe’s. To add a touch of high end design, Karin brought from her studio Antique Hydrangeas, Floral Cabbages, Portland Cedar, and Brazilian berries. Oranges studded with cloves is the base of this arrangement, creating a unique orange and fresh green pallet. Fresh cut Gem Magnolia, Nandina greenery & berries and cedar are mixed with store bought white roses and ornamental cabbages. From the technical like how to properly soak oasis, prep flowers and how to use fresh fruits and vegetables to the high brow concepts of free form floral design and allowing for white space – each attendee took home something that they could use to create their own holiday designs this season! To mix or not to mix? An age-old question for your dining space.